Welcome to my little guide of Bristol shopping! 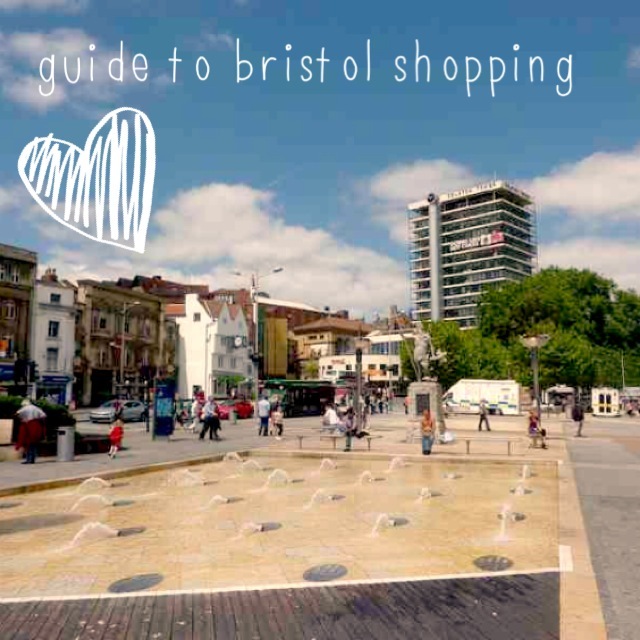 As someone who loves to travel and shop I decided it might be helpful to make a guide to Bristol shopping for anyone wanting to visit! 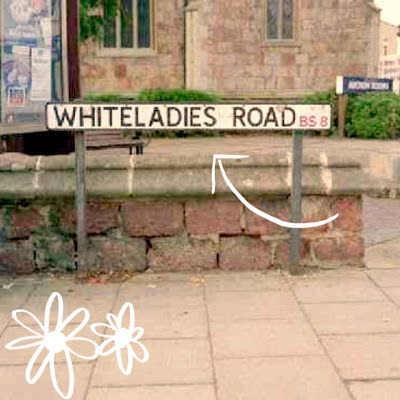 I've focused on all the little independent areas you might miss if you're just visiting, because it's easy to find Topshop and Urban Outfitters but us bloggers like to have a wander and try and find some treasure! Lots of these areas have plenty of charity shops, nestled amongst the boutiques as well as lots of sights and restaurants to make the most of your time here! I hope you like it and if anyone uses it please let me know :) Also if anyone has any suggestions of places to add send me an email because i'd like to keep it updated! Just off the Centre, head towards College Green, this place is one big hill so prepare yourself for a walk! This shop has been there quite a while and what originally started as a footwear shop has now expanded into an accessory and home shop. Quirk and independent this shop is full to the brim of cute shoes, and pretty little home accessories. Slightly more expensive than the other shops on this road, Cara is a clothing and accessory shop that is aimed at a slightly older customer. One of the oldest shops on Park Street, Uncle Sams has been there for as long as I can remember and is possibly the best vintage shop in the city. The style is American Vintage for both men and women, and this shop is full of denim shorts, silk shirt, sheepskin coats and retro jewellery. Not very expensive and 100% worth a visit. Although keep in mind, it's closed Sundays and bank holidays! An alternative fashion shop, think lots of chunky jewellery, (gold, silver, coloured) dolly dresses, t shirts and an in house piercist on some days! A fairly new vintage shop this one is just up the road from Park Street on Queens Road. I haven't been in here very much but it seems like it had a good selection of mens and womens but I do think it is fairly pricey for a vintage shop. Originally a record store Rise has now expanded to an in house coffee house and vintage clothing store. It has a bit of an Urban Outfitters feel where everything is quite mixed in together and the clothing is actually supplied by Sobeys from BS8. Easy to get to from Cabot Circus, head to the back of Debenhams and then under the Bear Pit! It begins as Cheltenham Road and then goes into Gloucester Road. Probably more well known for bars and club nights this area does have a good little niche of clothing stores and also has ALOT of charity shops, so make sure you pay them a visit if you're in the area, because you never know what you might find! Dutty Girl is the brainchild of two friends of mine who both have their own clothing companies and have created a space which is a great mix of streetwear and vintage. Upstairs is branded, lots of printed leggings, graphic t shirts and hoodies, downstairs is an absolute vintage treasure trove, literally bursting with bags, jumpers, scarves, everything you could imagine! I have found some absolute beauties in here and I would definitely recommend a look upstairs if you like chunky jewellery! What started as a little market stall for these ladies has now blossomed into a beautiful shop which comprises of a vintage shop on one half and a tea shop on the other. Lunch and afternoon tea is served daily and whilst i've never been it's definitely one my to-do list! Relatively new to Bristol, Fox & Feather is in a word beautiful! Stocking unique and independent brands, this shop is merchandised in a way that you instantly feel at home and want to buy everything! If you want to know more about this shop then Claire from Jazzpad wrote a great blog post on it recently which you should check out. Like Uncle Sams I can always remember this one being here, it's quite a way up the road from the other two but worth a visit. The ground floor is a good mix of retro & vintage, lots of shirts, denim and boots! 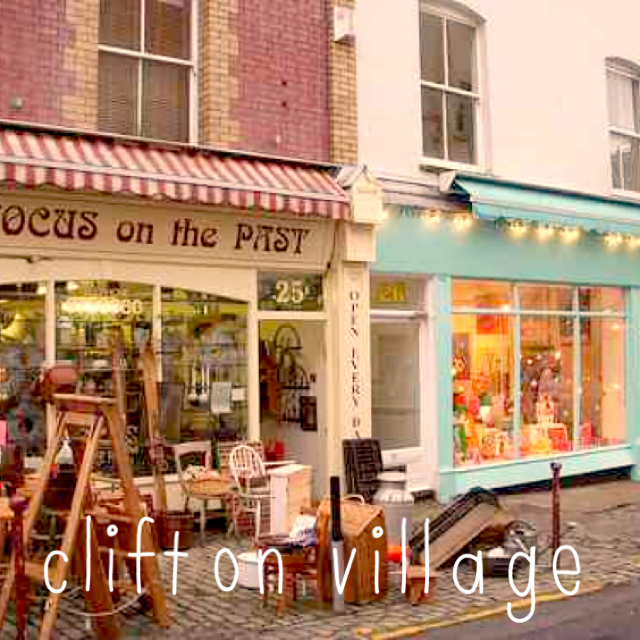 Upstairs also houses some incredible vintage furniture and house hold accessories and the basement is a vinyl shop. I really like it downstairs it feels your going back in time and my boyfriend has always found some good records down there. An old and beautiful part of the city St Nicks' is a market which is open daily and is home to several traders who have stalls inside the market hall and mini shops in the outdoor area. A huge mix of traders you can find anything from great food, to jewellery to super hot sauce! 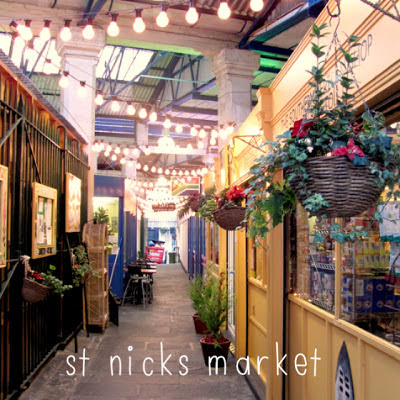 Have a wander round, definitely try some of the Moroccan food and just lose yourself! On Saturdays there is a market out on Corn Street where clothing traders, set up just for the day! Next door to St Nicks', Urban Fox is a newish vintage shop which (I think) is run by the same people as Resphyco! Fairly well priced, the shop sells Levi shorts & jeans, silk shirts, dresses and coats amongst other things! Less than a year old The Birdcage is a really lovely venue which is a coffee and vintage clothing shop by day and music venue by night. I've seen a few good gigs here had a really lovely dark hot chocolate which is worth the visit. The clothes are quite expensive but good quality and it's just a really nice venue, which I would recommend to anyone visiting for the day. My obvious favourite as I do a lot of work for them but Gimme Shelter is a shop inside The Lanes, on Nelson Street. The Lanes is a retro bowling and music venue, but tucked just inside the entrance is the little vintage shop which houses dresses from 50's through to the 80's along with more desired vintage like denim shorts, dungarees and loafers. Jamie and John whose shop this is also run a club night here every Saturday called 'Department S'. Keep walking up the right hand side of Queens Road, past the RWA and you will find Whiteladies Road; it's a more expensive part of town but expect plenty of bars and restaurants! I used to work in House of Eve so maybe i'm slightly biased but I love this shop! The front is filled with independent designer collections like Numph and Laundry Room, lots of pretty dresses all reasonably priced! The back room is a vintage dressing room with plenty of shoes, dresses and shirts, it is so well priced i've bought lots of vintage dresses for £20 and shirts for £15! Just off Whiteladies Road, on Cotham Hill, Naff Clothing has some great vintage dresses and accessories from 1950s- 1980s as well as lots of fancy dress costumes, face paint and wigs. Definitely somewhere to visit before heading to a festival! Probably one of the best jewellery shops in Bristol, this place is filled to the brim with vintage jewellery, a lot of it is very expensive but they also have quite a few cheaper sweet little things that make great gifts or just a treat for yourself! Quite small this shop, is filled with vintage clothing and accessories, I haven't bought anything from this shop before but a lot of the items are beautiful and would be amazing for parties! Lots and lots of vintage clothes and accessories, this shop has a great collection of bags and gets new stock almost weekly I think as every time I go, they have a whole host of new things! 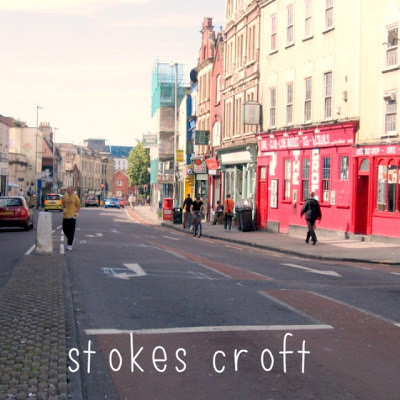 Thank you for this, Bristol isn't very far from me but I never know where to go! This is brilliant! 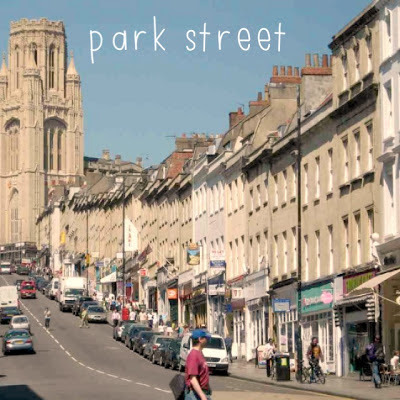 I've lived in Clifton for a year now but as a new undergraduate in the city last September I had no idea where the best shops were, I wish I'd have had this when I started!